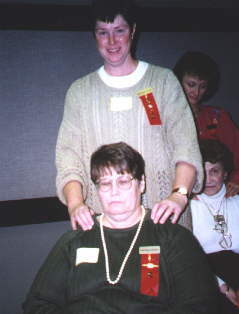 Alice and Jackie attended the "Therapeutic Massage" session at the Fall Workshop. They found out that anyone can do therapeutic massage with some key bits of information and the benefits are reciprocal. Alice and Jackie might be spending too much time together! Simonne Grzesik attended last month's meeting and brought a flyer about Stage IV ACT, the new adult community theater project she is involved with in Wayne. A flyer for donations is attached to the newsletter. Nancy Bielik's mother passed away this summer. We're very sorry for your loss, Nancy. June Chartrand, our snowbird, has left for Arizona. She is leaving earlier each year! See you in April, June. Carol Holland and Grace Morgan are planning a trip to Australia and New Zealand in the near future. Members who attended last month's meeting were: Bonnie Schweitzer, Debbie Ervin, Marcia, Scarr, Judi Fisher, Barb Broadley, Ruth Everett, Helen Mate, Carol Anderson, Donna Colaianne, Grace Morgan, June Chartrand, Nancy Bielik, Shirley Wahlstrom, Susie Miller, Jackie Smart, Mary Hendrien, Cindy Dietz, Carol Holland, Fran Saenz, Simonne Grzesik, Marie Canzoneri, Colleen Retherford, Esther Loskowske and Judy Handley. If you are missing from this list and are not currently on a milk carton, try to attend this month's meeting. 129 members attended the Fall Workshop held in Lansing in September. $150 was raised for the World Fellowship Scholarship fund from the proceeds of a 50-50 raffle. Beta Gamma chapter was dissolved. Nine members transferred to Psi chapter near Grand Rapids. All chapter members are requested to send $2 to help pay for Dr. Paula Dent's reception in Dallas this summer. The reception costs about $7,000 and Alpha Iota State-Michigan is responsible for the cost. May 1-3, 1998 is the State Convention. It will be held in Troy , Michigan. Registration information will be in the Winter Wolverine. Deadline for articles for the next Bulletin is Dec 20. Send your copy to Jackie Smart. Please drop me a line! November 5: This month's meeting is sponsored by the Professional Affairs Committee. There will be a True Colors presentation (personality traits) given by our own Alice Duke. Dinner will be at 5:30 at the Water Club Grill, Inc. and the presentation will begin at 7:00. December 10: The Music Committee (June, Esther, Sandy and Colleen) will send a flyer letting you know what's happening in December. March 11: Personal Growth and Membership Committees will sponsor our new member orientation meeting. We will meet at Water Club Grill, Inc. for dinner at 5:30 and the meeting will begin at 7:00. April 1: Installation of Officers, Initiation of New Members and Birthday Dinner will be held at a location to be announced. May 1-3:State Convention, Troy. Details will be in the Winter Wolverine.